Troy Wednesdays 2.5.18 Die, Fractus, die! “So this little universe you’ve created will make a lovely base of operations once I’m finished with you. So, be so considerate as to expire, won’t you?” Dasaelos Gurao casually closed his massive scaly hand around the throat of his victim, lifting the battered, enervated form of the Fractus to eye level at his height of three meters. The Fractus struggled weakly, still barely alive, desperately trying to grip the massively muscled forearm of his assailant, to try to breathe. Dasaelos had used a hypershard cloaking system and caught the Fractus unawares in his sanctuary pocket universe, and the rest followed from there. The reptiliaform giant squeezed, tightened his grip until he felt his victim’s windpipe give, and heard the neck vertebrae give a satisfying Pop! Even the medical functions of his hypershard couldn’t save the Fractus from a crushed windpipe and broken neck. He had already begun turning blue in the face. The old man’s form went limp, as his hypershard struggled uselessly to repair the damage while the alien warlord maintained his grip. In moments, Dasaelos looked into the dead, staring eyes of the Fractus, squeezed one more time, just to make sure, and dropped the body to the floor in a heap. A booted foot crunched ribs and collar bone, for good measure, as the giant stepped onto and over it. This day, the warlord thought to himself, I have earned the title Killer of Gods. I foresee glorious slaughter of the hairless apes overrunning the galaxy, and it shall be good. Troy David Loy is an eternal student, a writer, and blogger owned by two cats, Ricky and Eccles. He is co-author with Miss Sharmishtha Basu of two published books, and solo author of three books on Amazon for Kindle, with a fourth book on the way. He lives with his family and values his friends, family, and the flourishing and the well-being of his species in dangerous times. He seeks one overarching goal: to help make the world a better place in his own tiny, drop-in the- ocean way, one piece of fractal artwork, essay, or story at a time. He battles the Forces of Darkness™ from his secret volcano lair in Virginia as Troythulu while his eldritch tentacled servitors from beyond time and space keep the lab in good condition. opponent. But suddenly, light rippled across his form, and he stirred, rose to his feet, and seemed to find new strength. His eyes now balefully glowing a pale spectral green. implanted fangs showing in a display of utter satisfaction with the situation. Something was terribly, terribly wrong. He, no, they, spat blood to their left as the medical functions of the hypershard repaired the damage to their body, bones clicking into place and resetting as tissue mended. Dasaelos stepped back a pace from what had seemed an easy victory, and the death of yet another of these upstart godlings of Earth. His suddenly no-longer vanquished opponent sized him up, as if seeing him for the first time. What is going on? The giant thought to himself. He was now getting very, very unsure of his chances of winning this fight. “Mirus?” His bass rumbling voice quavered just a bit in his uncertainty. “Say goodbye, big guy. In your next life, make sure you think twice before crossing paths with us again.” The Magnus were serious about the ‘next life’ part. Dasaelos was a serial immortal, with plenty of cloned bodies in stock to replace this one. The Mirus – sorry, the Magnus – opened their mouth wide as the Rj’lt’ar giant took several more paces backward and then turned to run. The same pale green radiance that shone from the Magnus’ eyes now did so from their open mouth, jaws nearly distending as a lance of cold light shot forth from it, striking the alien warlord, enveloping his form, and fading as his body was reduced to a quark-gluon plasma and fundamental particles with even stranger properties, the whole vaporous mass being sucked into a pocket dimension outside of this region of space-time. nimbus, on their way home. The Mirus stood there for a moment, looking to the stars above. Then, he rose skyward, riding the gravity well to orbit where his vessel, the Emulael Enza, waited. As he did so, he heard the faint whisper of his hypershard’s data flow, now fully aware of his new darker persona. And deep in the recesses of his mind, the Magnus smiled and winked to their outward self. Someday, when they were needed, they would be back. Farattuur looked about, suddenly nervous from the slightest crackling sound of foliage, the crunch, crunch, crunch of crushed leaves in the autumn forest. Something was tailing him, and it wasn’t friendly. He pulled out his officer’s laser, and scanned the area about him with smart-contacts that gave him a live feed of augmented reality data via drone telemetry. He decided to switch to infrared, and suddenly caught sight of his pursuer. A big one, standing fully four meters tall, and carrying a heavy rifle that would look like a cannon to a smaller human. Damn. Mokthraga. They’d hired Mokthraga mercenaries. Farattuur remembered his last encounter with the species, a race of hominoid giants from a world rich in heavy metals. That did not go well for his team, sent to extract a fellow soldier from a combat zone after a botched mission. “Bradak’Tul!” He shouted into the forest. “Show yourself! Meghuruut! Enemy!” The rippling effect of a cloaking device suddenly flared with a pulse of ultraviolet and cerulean blue light as the giant, or rather giantess, revealed herself, a woman of more than twice the height of an ordinary human, and built to support every centimeter of it, carrying a rifle that would make a Tyrannosaurus rex nervous about commencing hostilities. It was a bit late to react for Farattuur, though, as the giantess had already drawn a bead on him, the telltale dots of a laser-scope already marking him between the eyes. Odd. The weapon looked built from borrowed Broogh technology. It was an insight that did little good as he felt the nearly infrasonic “poom!” from a concentrated gravitic pulse, just before his skull opened like a raw egg and his body, now minus its cranium, toppled to the forest floor.The woman looked in his direction, examined her handiwork before packing up her weapon, whistling a happy tune, and went back to meet her combat mates. Several of the onlookers trembled as they clutched their useless weapons. It gestured, and its captive audience collapsed to the floor of the cave, forever free of the screaming in their brains, their fear—and their lives, in several heaps of charred and unfleshed bones. It thought to itself: Good to be rid of those smelly little piles of human trash, messing themselves at the very sight of me. I think it’s time to do likewise with the rest of the hairless apes on this world as well! 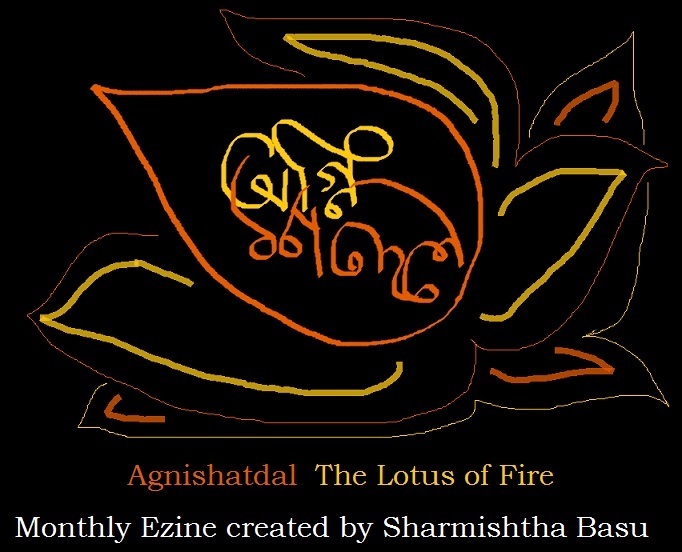 Meet Troy David Loy Guest Author of Agnishatdal and Indie Adda! brandy, and so out of commission. Mwelph and Brast were new in town, having ridden in on Wednesday, and ready to ride out of town in a night or two also on Wednesday. Wednesday was the name of their ship, a cheap, run of the mill saucer-shaped craft patterned after old movies from the science fiction of the ancient mid-20th century. All they needed was a Robby the Robot prop to complete the ship’s decor and they could make guest appearances at science fiction conventions. But here they were looking for cash, and lots of it. Mwelph opened his picks, a set of quantum keys used to quickly run through all possible combinations for the banks security lock, and to deactivate the alarms that had been placed for just such intrusions as this. The two were overwhelmed by the amateurishness of the security measures, but he and his partner kept their silence as they made way to the vault once entry was made. Another type of quantum key was placed on the vault. This would be a tough one, with quintillions of possible combinations needing a much more complex array of q-bits to calculate the superposition of all. Seconds flashed by as billions, then trillions, and after a minute of tense waiting, the final quintillions. Then silence. It had just stopped, but the door wasn’t opening. No, wait! Now it was! A faint squeak of poorly lubricated hinges sounded as the vault door swung open, and a billowing fog oozed into the room, with a faint light showing from within. What the hell was this? His radiation counter was going off. Something within was giving off a lot of radiation. Mwelph blinked as he looked into the vault. Not believing what he was seeing, he blinked again. Bananas. The entire vault was filled from floor to ceiling with bananas. There were apple bananas, ice-cream bananas, cooking bananas, but not a single cavendish in the lot. All of these were from the banana groves of the planet Mindallax. What the h*ll was wrong with these people? Bananas as money?! Then he and Brast remembered that the natives of this planet were descended from uplifted Terran gorillas. No, not brutish, hulking humans, but literal effing gorillas with slightly above human intelligence, for whom this was a valuable form of barter currency as well as a tasty snack. The two would-be bank burglars quietly closed the vault and dejectedly snuck out the way they came in, kicking themselves all the way to the spaceport as they left this forsaken planet and went to seek better targets on economically sane planets – that didn’t use produce as money. It was three in the morning as Daryl chanted the last words of the incantation, sure that this time he would summon a mighty agent to avenge the loss of his job. Fire him from work, would they?! The visitor stepped through the lattice of swirling green vortices into this world. It then reached behind itself, toward the opening, and closed the portal behind it. Swirling green vortices spun, faded, and blinked out as the figure approached, claws glistening with slime and feathery moth-antennae flailing, its insect-like eyes adjusting to the light, as if the illumination was painful, causing it to wince at first upon entering the room. Daryl got a good, long look at it, as it shambled toward him. Grabbing him, it gestured again, this time opening another gate, and, dragging him along screaming, strode toward it, anticipating. The visitor was hungry, and this would be its most recent meal in a long, long time. As it walked through its gate the visitor thought to itself. Why is it always morons who summon me? Once, I was called forth by some idiot in the 1920s who wanted to become a millionaire. Another, by this imbecile in the 1970s who wanted immortality! An ultra-terrestrial’s work is never done. But on the other hand, slow-witted summoners are quite tasty when braised in a little blue wine sauce!